Fayette’s Porter Maginn handles the ball in open space Tuesday in a win at Swanton. They bested the Bulldogs in overtime, 45-40. Josh Vance of Swanton drives to the hoop Tuesday versus Fayette. Clayton Pheils of Fayette attempts a three-pointer. He had 15 points for the Eagles in the win over Swanton Tuesday. 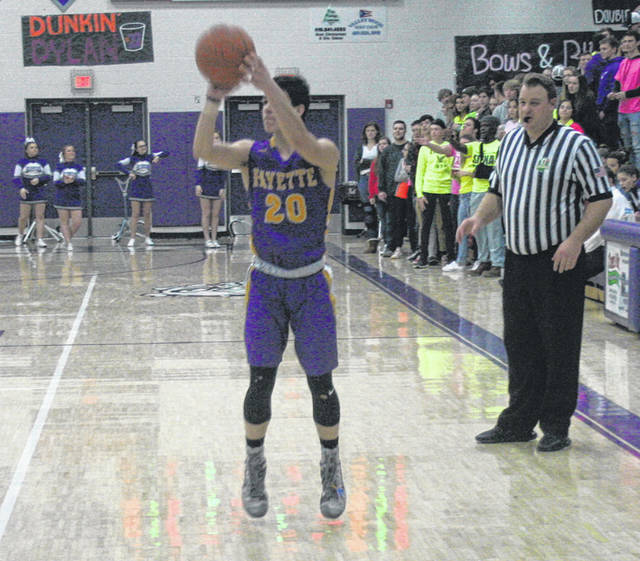 Although he was held in check for a majority of the contest, Fayette guard Clayton Pheils found his shot when it mattered most Tuesday in a non-league boys basketball contest at Swanton. He scored 11 points in the final 6:50 of the game, including overtime, as the Eagles pulled out a 45-40 win over the Bulldogs in the extra session. But first, it was Swanton who took charge in the first half of the fourth quarter. They went on a 13-2 run to take a 34-29 lead with 3:30 remaining. Trailing 27-21 to begin the period, Jared Wilson started the flurry with back-to-back three-pointers, followed by a long-ball from Randy Slink and Dylan Gilsdorf’s tip-in to make it 32-27 at the 3:51 mark. Trey Keefer responded with a basket for Fayette, and then Josh Vance answered for Swanton. However, it was at that point when Pheils got hot for the Eagles. He scored five straight points, the latter on a triple to knot the score at 34 with 2:11 left. 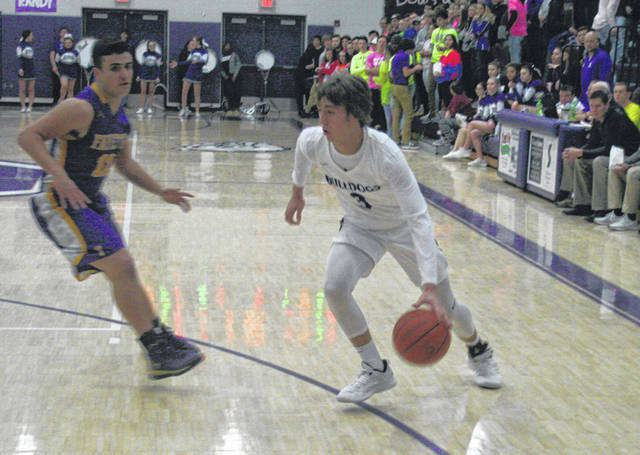 Gilsdorf reclaimed the lead for Swanton on a layup 17 seconds later, but the Dogs missed an opportunity at icing the game from the free throw line. They missed a one-and-one on consecutive occasions in the final minute. When they did finally break through on a freebie from Wilson with 22 seconds to go, he missed the second attempt which left Fayette an opportunity at a game-tying three. Pheils took advantage, knocking one down near the top of the key to make it 37-all with 10 ticks to go. The Dogs got the shot they wanted as Slink sliced through to the rim in the closing seconds, however, the ball rimmed out to send the game to overtime. In overtime Pheils picked up where he left off, drilling one from long range 51 seconds in. Keefer added five points, including 3 of 4 at the line, to help his team close it out. Swanton was held to a combined three free throws from Andrew Thornton and Gilsdorf in the extra session. The first half was pretty much a wash, with an 8-5 second quarter in favor of the Eagles being the difference. Fayette took a 15-12 lead into the break. And while coach Visser was displeased with his defense, Mitchell came away impressed. “They are so athletic and long. They just gave us all kinds of problems all night,” said the Fayette coach. “We had a hard time getting into stuff. We never really felt comfortable in the halfcourt. Keefer had 19 points to pace the Eagles. Pheils, after making just one shot in the first half, had 13 in the second half for a 15-point night. 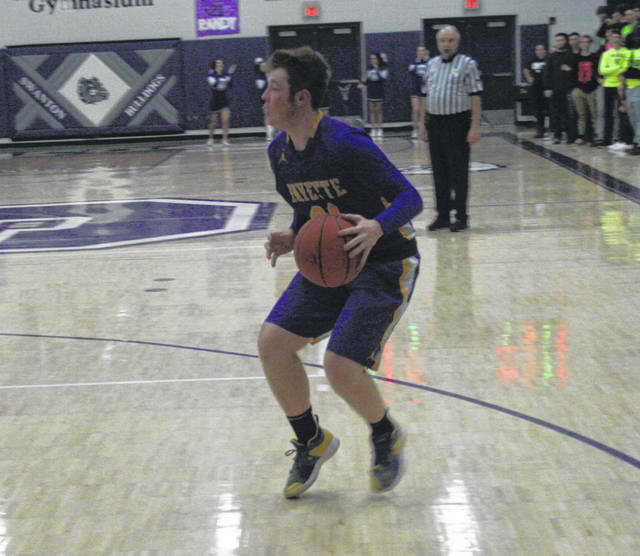 For Swanton, Wilson had 18 points and Gilsdorf tacked on nine. Fayette (9-4) has home games with Montpelier Friday and Hicksville on Saturday. Swanton (5-8) travels to Patrick Henry Friday before hosting Genoa on Saturday.